GENERAL LOCATION Northeast corner of Peter Hauck’s farm in section 11; the 1888 building located a quarter of a mile east of the center of section number 10, town of Oakdale. DISPOSITION The school was moved and used as a farm shed on the Eder farm after the school was vacated in 1920. The school was moved to the Oakdale Nature Center in 2004 and operated by the Lake Elmo/Oakdale Historical Society until early 2016 when the Washington County Historical Society took over the management and programming at the site. School once held in the homes of John Morgan, H. D. Apman, and Jacob Sullwold. Consolidated with Lake Elmo school in 1920. District 12 was organized July 29, 1861 at the home of John Morgan. The first school, a term of three months, was held at Mr. Morgan’s house. In 1867 a tax of $350 was levied for the building of a school house, which was completed January 1, 1868 and was located on the northeast corner of Peter Hauck’s farm in section 11. School was held in this building until it burned in 1888. The school was erected during the early winter of 1888 at a cost of $400. It is 18 x 30 feet in size and has seating for about 30 pupils. All eight grades were taught by one teacher. Sometimes there was no one in a certain grade, and 3 or 4 students in another grade. 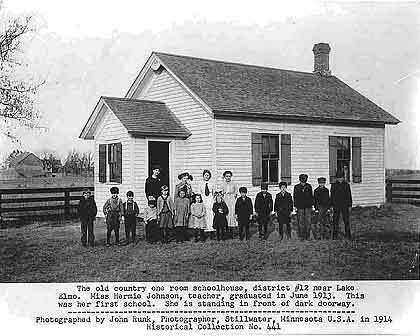 In 1921 the schoolhouse was moved one block north from its original location east of Lake Jane in Lake Elmo and served as a tool shed for the Eder farm. It remained there until 2000 when Myrtle Eder donated it to the Oakdale/Lake Elmo Historical Society. The schoolhouse was then moved again to where it is now situated within the Oakdale Nature Center. Myrtle Eder attended the school as a first and second grader in 1918 and 1919 and her teacher was Myrtle Hunstiger. On May 23, 2004 Myrtle Eder 92, and Myrtle Hunstiger 105 attended the private ceremony celebrating the opening of the restored schoolhouse. Mrs. Hunstiger gave a very interesting talk about what it was like teaching in the school in 1918 and 1919. There was never electricity in the school. Think of all the things that your education relies on for electricity. There was also no plumbing and the water for drinking had to be pumped from a hand pump in the school yard. Since there was no plumbing, there was an outhouse in the yard, one side for girls and one side for boys. They were very cold in the winter time. Light was provided by oil lamps. Heat in the school was provided by a wood stove, which the teacher or some of the older boys had to light up each morning. Wood had to be chopped and carried in and put in the wood box. The children brought their lunch in pails similar to the ones in the entry way of the school. Maps were quite different than they are now because we did not have as many states as we do now and other countries were not the same as they are now, many have new names and have changed and many are independent now.